Quick—someone get me a tissue, a hug, and a big ol’ glass of sweet tea. The Murphy women of Kristy Woodson Harvey’s Peachtree Bluff series are back, and they are bringing along all of the feelings. Following last summer’s stunning Slightly South of Simple, The Secret to Southern Charm transports us back to the quaint coastal town of Peachtree Bluff, Georgia, where sisters Caroline, Sloane, and Emerson have moved back into their mother Ansley’s beachside home, quickly overrunning her tranquil empty nest. While each sister is at a crossroads in her life, this novel focuses on Sloane, who is grappling with the fact that her military husband, Adam, is missing in action. Incapacitated by grief, denial, and too many old home movies, Sloane can barely bring herself to function, let alone take care of her two young sons. Concentrating on her daughter and grandchildren’s anguish, Ansley puts her own life on hold to take care of them—which isn’t so easy to do when her first love, Jack, is living next door, and the decades-old secret she’s been holding onto is bubbling at the surface. Through tragedy, hope, hidden truths and buried dreams, the Murphy women band together to keep Sloane from sinking, proving that when tested, there’s nothing strong women can’t get through—especially with family around. I fell in love with Peachtree Bluff the moment I picked up Slightly South of Simple last year, and it felt so good to book a return ticket with The Secret to Southern Charm. Kristy Woodson Harvey excels at creating real, complicated characters you instantly care about and root for, even when—or especially when—they’re making mistakes. The town itself is so warm and familiar I’d swear I spent my own summers there growing up, and its residents, from Hippie Hal and his refurbished bikes to Coffee Kyle, the hot door-to-door barista, feel like old friends. 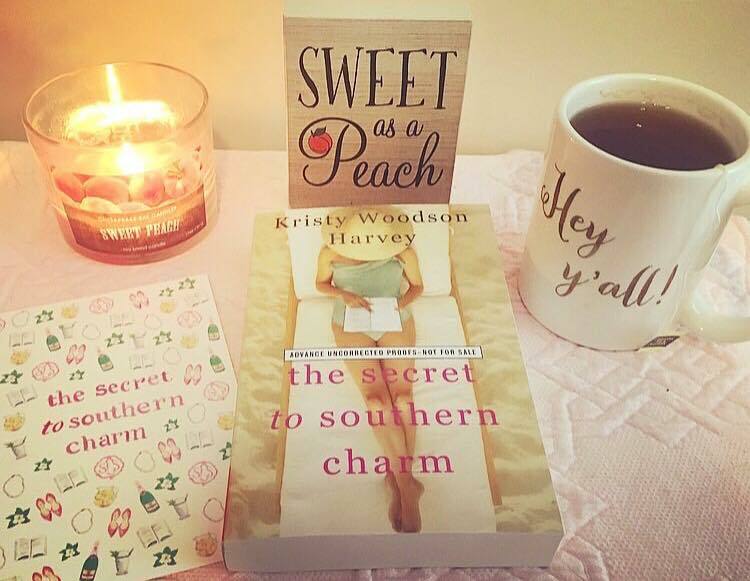 As with all of Kristy Woodson Harvey’s novels, it’s the relationships that make The Secret to Southern Charm a treasure. I laughed and cried and cried some more over the beautifully messy map of love among families—the ones we’re born into, the ones we build around us, and those wonderful, quirky amalgamations of the two. I savored this book like a sweet tea on a hot day, and I truly can’t wait to get back and meet up with this crew all over again. The Secret to Southern Charm is a must-have addition to your spring or summer reading list. If you haven’t read Slightly South of Simple, I strongly encourage you to pick that one up first, as it sets the canvas for all that follows, and oldest sister Caroline’s story is too good to miss. So pour yourself an icy beverage (or have Coffee Kyle do it for you) and be prepared to get swept away to the warm and winning Peachtree Bluff. This is one you’ll definitely want to share with your book-loving friends. It’s far too delicious to be kept a secret. The Secret to Southern Charm releases tomorrow, April 3! For more on Kristy Woodson Harvey, visit kristywoodsonharvey.com and be sure to follow her on Facebook, Twitter, and Instagram. Kristy is also celebrating her launch week over on Bloom, the fabulous Facebook group hosted by the Tall Poppy Writers! Thank you, thank you, thank you for this wonderful review and all your support. Plus that photo! GORGEOUS! You are SO welcome, Kristy!! I love these books and these characters so much!